Utility line workers face daily dangers on their jobs as they seek to provide us with a continuous source of electricity that many people take for granted. These employees must work in dangerous situations when there is a potential gas leak or people lose electrical services. Even on a routine day where they are doing maintenance, they must work from heights and near electrical power lines. In addition, they must work on electrical equipment like transformers, fuses, meters, and voltage regulators and repair old pipes, power line poles, towers, and electrical lines. As a result, they can suffer horrific injuries or die. Fortunately, they may be entitled to workers’ compensation benefits to pay their medical bills and lost wages while they are off work—if they can return at all. Electricity. Workers are constantly working with electricity in homes, businesses, factories, and other buildings or on or near powerful electrical lines. Electrical accidents can happen in many ways that can cause workers to be electrocuted or suffer electrical burns. Slips and falls. Utility workers often must work in rain and snow storms, heavy winds, and in flood conditions to restore power. They are working from heights and in wet, slippery conditions. Even if they have proper fall protection gear, falls from heights are a serious danger as are slip and fall accidents on the ground. Chemical and other toxic substances. When electric line workers must work in emergency situations like an explosion, with electrical lines in older buildings, or even power stations built before asbestos was banned, they can be exposed to hazardous chemicals and toxic asbestos. Unfortunately this exposure can cause them to suffer deadly occupational cancers and other diseases. Collapsed tunnels and trenches. When employees must work with electrical lines in tunnels and trenches, they can suffer life-threatening injuries or die if the tunnel or trench collapses and buries them. Cold and heat stress. Utility workers often must work in the most extreme weather conditions because that is when people typically lose electrical power. As a result, they can suffer frostbite, hypothermia, heat stroke, heat exhaustion, and dehydration. Overexertion. 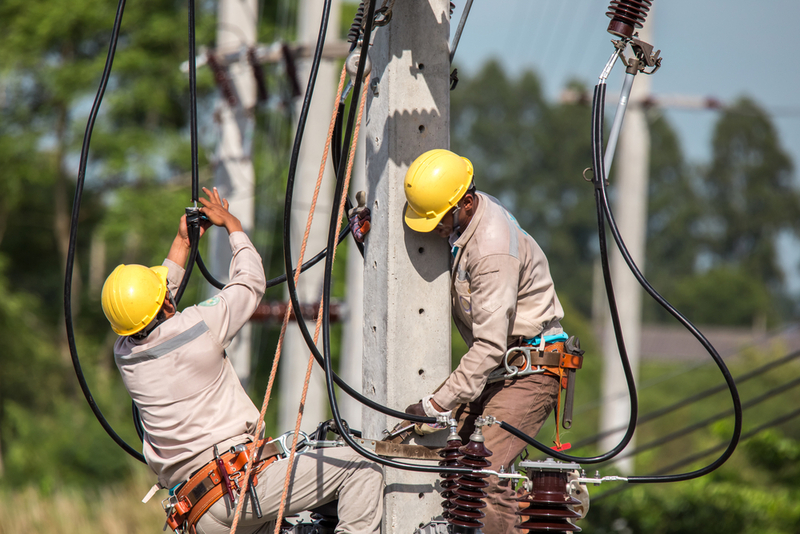 Given the long shifts and fast pace of their work, muscle strains and tears and other injuries caused by overexertion are a common reason utility workers must take time off work and file workers’ comp claims. Driving accidents. Utility workers are constantly driving to different job sites, which puts them at greater risk of being hurt in a motor vehicle accident. This danger is increased due to the long hours they must work and the bad weather conditions they must drive in. Repetitive stress. Repetitive stress injuries to the hands, elbows, wrists, and knees are the consequence when workers must perform the same movements, use vibrating tools, and work in cramped conditions that put their bodies in awkward positions. Hand injuries. When workers do not have proper hand protection, they can suffer hand injuries caused by pinching, being struck, or crushing accidents. Defective tools. When power tools and other heavy equipment are defective or in need of repair, it can make a dangerous work environment even worse. Workers can suffer many serious injuries or die in preventable accidents. What Injuries Do Utility Line Workers Suffer? Were you injured in one of these accidents? Was a family member killed? Start an online chat to schedule your free consultation with consultation with Manfred Ricciardelli to learn how filing for workers’ compensation benefits can help you.